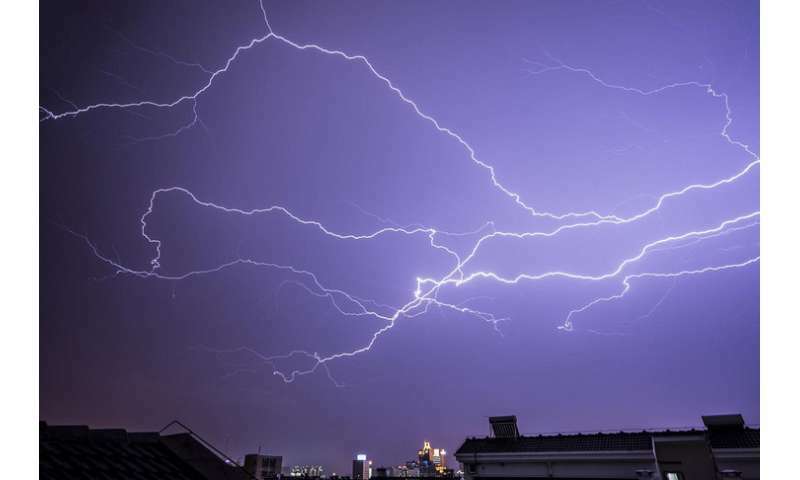 The team, who report their findings today (Feb. 17) in Scientific Reports, found that the strength of the East Asian Summer Monsoon decreased at a rate strongly correlated to that of severe weather throughout the same time period. The monsoon is an annually recurring, long-term weather phenomenon that brings warm, moist air from the south to China in the summer, and cooler air from the north to China in the winter. A monsoon's strength is measured by calculating the average meridian wind speed in this area. Wind shear is the difference between the wind speed and direction at different altitudes. Because a monsoon brings southerly winds into China, a weaker summer monsoon would decrease the overall low tropospheric wind shear. The weaker monsoons would also bring less warm, moist air from the south—one of the most common sources of instability in the atmosphere. A common triggering mechanism for severe convective weather is lifting by the front, a high temperature gradient across the monsoon, and this would also be reduced in a weaker summer monsoon. Some studies suggest that climate change may be one of the reasons that the Asian Summer Monsoon weakened. One factor in monsoon formation is the difference between the temperature above land and the temperature above adjacent ocean or sea. A warming climate would affect the difference between these two and, as a result, simulations show that this could continue decreasing the monsoon's strength. However, the team noted that other major changes in the area—such as an increase in industrialization and air pollution in China in the 1980s—might have played a significant role in the region's atmospheric changes and could affect the severe weather. Given their emerging concern about severe pollution problems, China is well positioned to receive the climate change media virus. Perhaps it can become the go-to destination for U.S. climate scientists seeking a new safe space. I trust you will therefore understand why I cannot allow your above ill-informed and/or obviously politically/personally biased/motivated comment to stand unchallenged by the Reality evolving around us globally. 1) In Moree (Northern NSW, OZ) they have had 51 consecutive days of above-35 C temps; the previous record was a measly 17-19 consecutive day of such temps! 2) At least one of our beaches reached SAND TEMPS of 75 C; yes, that is C, not F, mate! Conservationists had to intervene to move/shade Turtle nests/eggs! Re the China weather topic/article, it should also include the effects of China's frequent/widespread use of "Cloud Seeding" to 1) make systems drop rain in preferred areas/times and 2) reduce the moisture load of dangerous systems before they 'break' later over sensitive/vulnerable agricultural/infrastructure locations etc. Cloud seeding and moisture load reduction etc must affect the otherwise natural evolution of storm systems to their previous less frequent but more extreme dynamics/events. Anyhow, all such studies should be careful to include ALL factors and not just the factors most easily quantified/available due to weather data which may not take into account the effects of seeding and other changing dynamics data not easily gathered' for the study. China is well positioned to receive the climate change media virus. The President of the global superpower insists China started this. Sorry socialist greenloons. China won't be doling out billions for your worldwide wealth re-distribution scheme. What about for the last 10,000 years, 60 years of data, there is not enough data points to make any predictions? That was the summer of 1980, the place was north Texas, and the CO2 concentration was 280ppm. A few years before, the professional catastrophist James Hansen had warned that global cooling was going to end civilization by the year 2000. LOL. By the way, that record still stands. The weather changes over time. Human caused climate change is a singular fraud upon mankind. "Study shows China's severe weather patterns changing drastically since 1960"
"Study shows China's severe weather has decreased significantly since 1960"
The headline sorta suggests a contretemps between climate as experienced and the hypothesized "climate change." Can't have that! As Twain said, the difference between the right word and the almost-right word is the difference between lightning and the lightning bug. Or news and fake news, in this case. But it's the SUDDEN/EXTREME CHANGEs in 'norms' in ANY place; in my example a place where most consecutive days over 35C WAS 17-19, but NOW 51 consecutive days! Such TRENDING extreme CHANGES create havoc/costs to health, infrastructure, agriculture etc. Didn't you understand my earlier explanation elsewhere regarding Venus situation and atmosphere preventing escape of internal heat coming up to surface/atmos? Even if solar radiation is totally blocked at high altitudes, the build-up over billions of years of heat from internal source would produce what we observe now. Again, it's the atmospheric thickness/constituents etc properties which ultimately determines a NET resultant temp/effect regardless where the heat came from. In the case of Venus, the heat cannot escape to space as readily as on our planet, so the the part of the 'greenhouse effect' that most applies is the trapping/internal reflection of heat/radiation from 'below'; which creates the observed situation despite little sunlight reaching down into lower atmospheric layers. It's RATE OF CHANGE that is so damaging/costly for existing humanity and current infrastructure/agriculture/economies/health etc. How long before you 'get' that very important subtlety, mate? Your simplistic sloganeering ignores all of the actual reality involved, and just panders to the naive and simple 'minds' which politicians and religionist 'exploit' to their own self-interested advantage, at great costs to humanity as a whole, well into future generations. Dyson admitted otherwise since his early ignorant remarks. We now know that as sea-ice sheets/packs melt, the most crucial 'hunting' areas/prey (seals/dolphins at 'breathing holes') are no longer available/easy. They will therefore be constrained to poorer/less-dependable prey/areas on land, competing with grizzlies etc. Not at the speed it has been changing since the industrial revolution. Change is not the issue. It's the SPEED at which it's happening. To a slow crawl over many thousands of years we (and other life) could adapt. Change at the rate that is occuring now is a threat to our ability to sustain ourselves at the level we're at. China installed more solar than any other country last year. They have massive smog problems in their cities and are starting to see that if they have to continue shutting down factiries that means their economy will suffer.